2 x LG 3D Glasses AG-S100. 2 x LG 3D Glasses AG-S100. . Condition is Used. These have only been used a couple of times come boxes with all cables etc. Only selling as TV has broke and now no use for them. I have 4 pairs in total for sale 2 pairs in each box. (If you want all 4 pairs postage will be higher please message me for total postage cost) Dispatched with Royal Mail 1st Class. LG AG-S250 Active 3D Glasses For Use With LG PZ950, PZ970, PZ550, PW350 3D TV. Condition is Used. Dispatched with eBay delivery – Shutl 2-3 days. This device only works with compatible 3D Ready LG PDP TV. To experience LG's 3D technology you need a 2010 LG 3D ready TV and LG's 3D Active Shutter Glasses. The glasses communicate seamlessly with the TV's emitter. The result is a beautiful, full HD 1080p 3D experience that brings you closer to the action from the comfort of your living room. Net Weight. 7.9” x 6.3” x 2.7”. 2 x LG AG-S360... Active 3D glasses LG Plasma TV 2012/2013 PM PH series. Using the 2.5 GHz RF radio frequency, they provide a great wireless signal for more comfortable TV watching wherever you're sitting in the room. 2 xLG AG-S360 (repl. S350) Active 3D glasses LG Plasma TV 2012/2013 PM PH series. 5 out of 5 stars - 2 x LG AG-S360... Active 3D glasses LG Plasma TV 2012/2013 PM PH series. 2 product ratings2 product ratings - 2 x LG AG-S360... Active 3D glasses LG Plasma TV 2012/2013 PM PH series. LG 3D GLASSES FOR LG 3D TV OR PROJECTOR MODEL AG-S250 AGS-250. Condition is Used. Two charging cables. Two glasses cases. Sold as seen. Will not end auction early and will not ship internationaly. 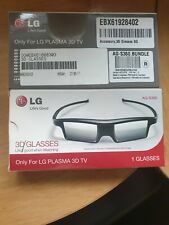 ACTIVE 3D GLASSES FOR 2014 LG 3D PLASMA TVS. 2 x LG AG-S360. Active 3D glasses LG Plasma TV 2012/2013 PM PH series. 5 out of 5 stars - 2 x LG AG-S360. Active 3D glasses LG Plasma TV 2012/2013 PM PH series. 2 product ratings2 product ratings - 2 x LG AG-S360. Active 3D glasses LG Plasma TV 2012/2013 PM PH series. It's never been easier or more affordable to enjoy 3D TV. Our Cinema 3D glasses are just like the ones you get at the movie theater, so there are no batteries required and they don't need recharging. Compatible with LG 2013 plasma 3D TVs. 1 x 3D Glasses. 1 Year warranty. Compatible with LG 2012/2013 range of 3D Plasma TVs. 3D Glasses (active). We make buying online as simple as it can be. 2 x LG 3D Glasses AG-S100. 2 pairs of glasses Neither of which have a Charging Cable. Condition is Used. Dispatched with Royal Mail 2nd Class. LG AG-S250 Active 3D Glasses For Use With LG PZ950, PZ970, PZ550, PW350 3D TV. PZ950, PZ970, PZ550, PW350 (not compatible with Cinema 3D or prior model year). Happening at a speed too fast to notice, your TV shows each eye a different image, creating the illusion of depth. The screens synchronize with your 3DTV which switches between showing images for your left and right eye when the corresponding lens lets the image through. 1 x LG 3D Active Shutter Glasses. Compatible Models - PZ750, PZ550 (not compatible with Cinema 3D or prior model year). 1 X USB CABLE. Specifications are subject to change without notice. While every attempt has been made by RepoGuys in the production of these specifications, possible errors or omissions may still occur. 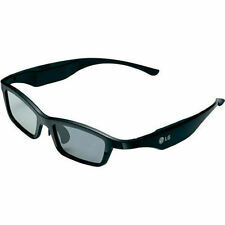 LG 3D Active Shutter Glasses for 3D Plasma TV/ Projector | AG-S250. 1 x LG 3D Active Shutter Glasses. Compatible Models - PZ750, PZ550 (not compatible with Cinema 3D or prior model year). 1 x CLOTHE CASE/COVER SLIP. LG AG-S350 - 3D glasses. We make sure that all products and services are at the highest level. Our staff will be glad to help you! THE BEST ELECTRONIC ORIGINAL ARTKILE. 1 xLG 3D Glass Active Shutter Glasses for 3D Plasma TV/ Projector | AG-S250. We are located at: Auburn NSW. Acct number: 10424393. BSB: 062141. Specifications are subject to change without notice. While every attempt has been made by RepoGuys in the production of these specifications, possible errors or omissions may still occur. 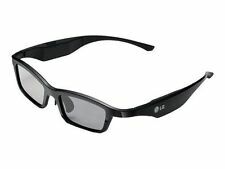 1 x LG 3D Active Shutter Glasses. Compatible Models - PZ750, PZ550 (not compatible with Cinema 3D or prior model year). Specifications are subject to change without notice. While every attempt has been made by RepoGuys in the production of these specifications, possible errors or omissions may still occur. Good condition and working. Glasses only. DO YOUR OWN RESEARCH - to check if these are compatible with your TV. I cannot advise what type to get. LG AG-S360... Active 3D glasses LG Plasma TV 2012/2013 PM PH series. 1 X LG AG-S360... Active 3D glasses LG Plasma TV 2012/2013 PM PH series. 5 out of 5 stars - LG AG-S360... Active 3D glasses LG Plasma TV 2012/2013 PM PH series. 2 product ratings2 product ratings - LG AG-S360... Active 3D glasses LG Plasma TV 2012/2013 PM PH series. Compatible LG Plasma 3D models- 60PB6900, PH6700, PM9700, PM6700, PM4700. Modern Dark Grey 2 Seater Sofa - Refurbished - Revolution Trading. Type Active 3D Glasses. Shutter Glasses. Ordered sofa 6 weeks ago, now 4 weeks late! This device only works with compatible 3D Ready LG PDP TV. Glasses only.